We love pizza around our house. My kids could eat it at least twice a week and not get sick of it. We used to pick up the take and bake pizza often, but then I discovered how cheap and easy it is to make pizza at home. If you are a little fearful of working with yeast you have to give this recipe a try. At our house, we eat pizza about twice a month in the fall and winter months. I love how heating up the oven in the cooler months can help to heat the house too. In the summer, I will cook this pizza crust recipe on our wood-fired grill, to make the pizzas outside to keep our house a little cooler on those hot summer days. 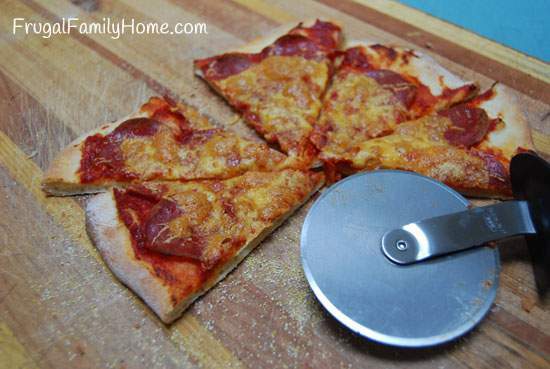 We prefer to have thin crust pizza and the recipe I use actually makes 3 medium sized pizza crust. There’s no oil in my recipe which helps to keep the crust crisp. This recipe doesn’t involve any rising time so it is also really quick to make. So if you haven’t ever worked with a yeast dough before the main thing to remember is to proof the yeast first. To proof the yeast you will want to stir the yeast into warm water and let it sit for about 5 minutes before you add it to the flour mixture. You want the temperature of the water to feel warm but not hot. If the water is too hot it will kill the yeast instead of helping it grow. You can tell the yeast is proofed when you see some bubbles start to form on the top of the yeast/water mixture. We like to add traditional toppings to our pizzas, things like, pepperoni, olives, green peppers and sometimes cooked ground beef. For cheese, we use goat gouda or goat cheddar, since we have cow’s milk allergies in our family. But the pizza is also good with the dairy-free cheese such as Daiya or Trader Joe’s dairy-free shredded mozzarella. Mix the warm water with the yeast and stir to dissolve. Let the yeast proof for about 5 minutes. Measure out the rest of the ingredients in a bowl and add the yeast mixture. Stir and then once all of the flour mixture is moistened place on a floured surface and knead about 5 minutes or until dough is smooth. 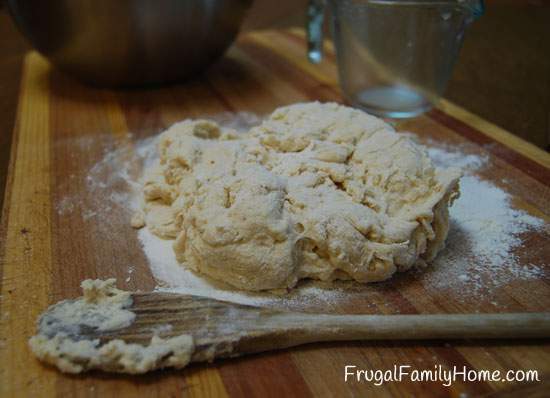 You may need to add more flour as you are kneading the dough. 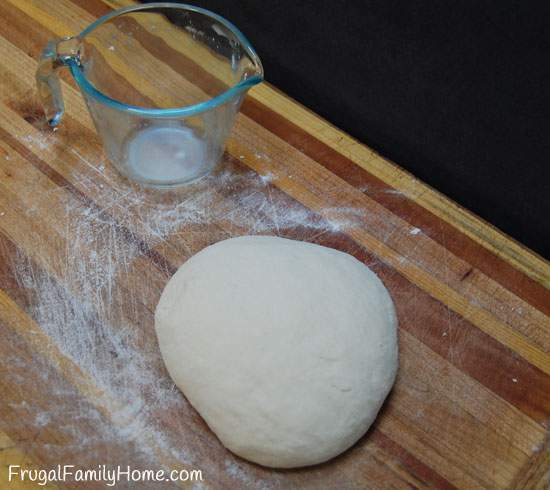 Divide dough into 3 pieces and roll each out into a circle. Bake 500 degrees on a cookie sheet or pizza stone for about 8-10 minutes or until pizza crust is golden brown. 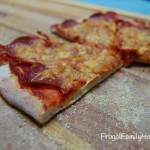 This recipe is adapted from Money Saving Mom's pizza crust recipe. What’s something you make from scratch that you used to purchase ready-made in the past? Have you tried freezing the dough? I wouldn’t need three 10″ pizzas on a given night with my smaller family. 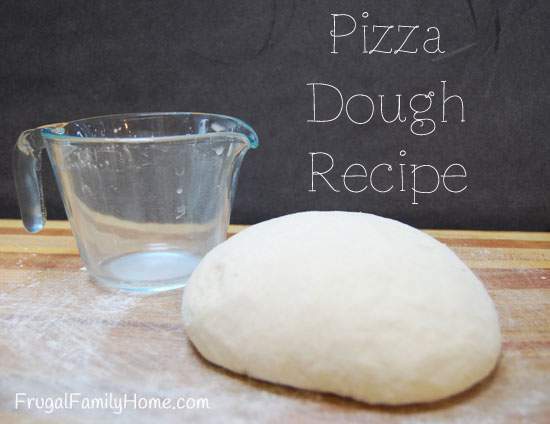 Have you frozen the dough to use on another night. I’m wondering how the yeast holds up to the freezing and defrosting process. Shelly, yes I have frozen the dough before, and it worked just fine. I wrap the dough in plastic wrap and then place in a gallon sized freezer bag. The night before I need it I will unwrap the dough and place it into a greased bowl in the refrigerator covered with plastic. I usually just reuse the plastic wrap the pizza dough was wrapped in to cover the bowl. I think you could also take the dough out the morning of the evening you are going to make the pizza and let it thaw in a bowl covered on the counter but I haven’t give this method a try so I am unsure how early you would need to take it out ahead of time, maybe 4 hours? I started making my own pizza crust a few months ago, and I just love it. I use the recipe that came with my bread machine, and it comes out great. I actually think I like it better than ordering pizza from the local restaurant! I used to have a bread machine and then it broke. I was going to replace it but I have not really missed it. We really like making pizza at home, with my family’s milk allergy if I make it at home they can have their cheese on the pizza. 🙂 But you know pizza isn’t too bad without cheese, we ate without cheese for years. Does the bottom come out crispy so the pizza doesn’t do the floppy thing? Hannah, I bake our pizza on a pizza stone in the oven and the crust turns out nice and crisp. I make sure to preheat my pizza stone while I’m making the pizza dough. I also put the pizza stone on the low rack at the lowest setting. I find this helps to really get the pizza crust nice and crisp. The pizza crust also works good on the grill. You can see how I grill a pizza at this post. If you like really crisp crust, you can leave the oil out of the recipe.